It’s official: you have a legal right to reach premises (homes or businesses) during Manchester Pride. Without a wristband, accreditation or a resident and visitor pass. 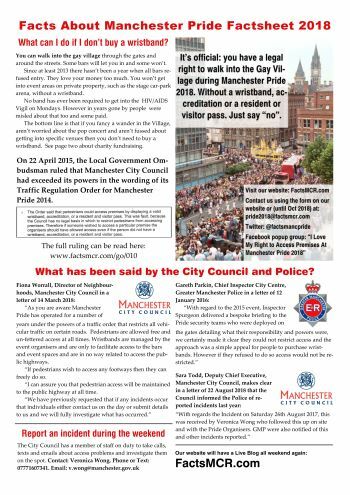 On 22 April 2015, the Local Government Ombudsman ruled that Manchester City Council’s wording of its Traffic Regulation Order for Manchester Pride 2014 was "unlawful." See the ruling here: factsmcr.com/go/010. Grab and share these images with quotes from Greater Manchester Police, Manchester City Council and the Ombudsman. Let us know your experience of getting into the gay village and being served. Our mail form can be found here. We're on Twitter and Facebook. 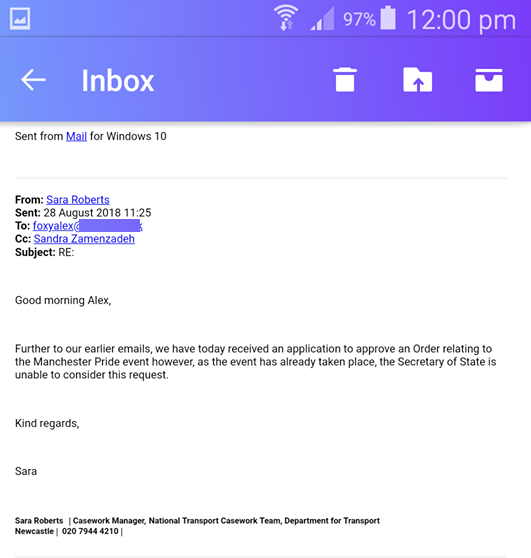 12:15 This morning it has been confirmed by the Department For Transport (DFT) that Manchester Pride went ahead without any street closure approved by the Secretary of State. 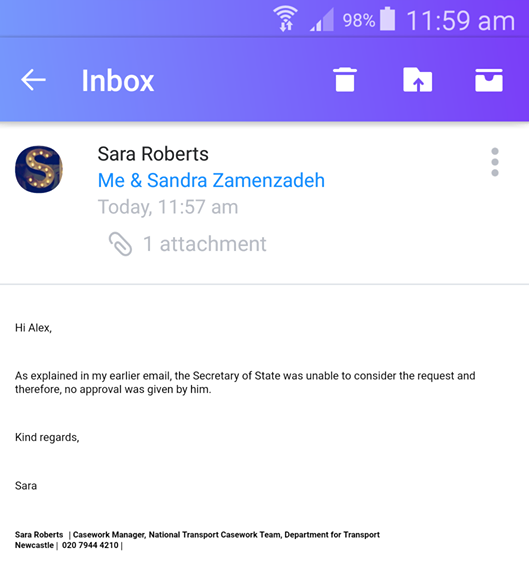 In emails to Alex the DFT says it didn't receive the Traffic Order from Manchester City Council until this morning after the event had finished. If the streets are closed for more than three days the City Council has to seek permission from the Secretary of State and that is done via the DFT. It would seem that at the very least the roads were illegally blocked for more than one day. But possibly for the entire four days, unless the Council did some sort of three day order itself for just part of the extended weekend. 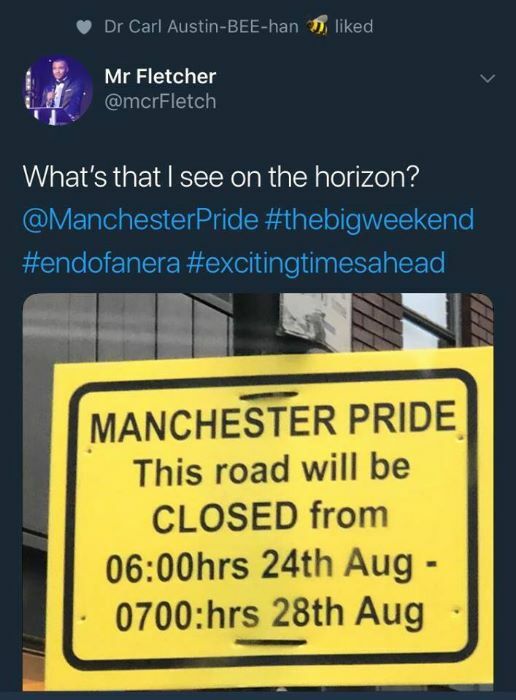 The CEO of Manchester Pride posted this image last week. Showing the advertised times of the closure. New York New York closed part of Bloom Street for an event before Manchester Pride began, which may have been under a different Order. 11:30 A few further experiences are being reported to us. Shelly writes that on Monday she "went in other stage entrance where they skipped bag check but told me my 2yr old needed a wrist band...they look baffled when told under 3s don't and let me walk in." 23:40 We've seen quite a few complaints from people who say they didn't receive their tickets through the post before the start of the event. Some of the most loyal supporters of the event have been let down in this way. Currently it's difficult to get a sense of how big a problem it has been. Richmond Tearooms misled the public. Claiming people would need wristbands to "get into the area". The Tearooms is on a public street and is run a Pride trustee. If you don't agree with the activities of businesses like this one then don't spend money with them. They have helped to keep the wristband malarky going to the bitter end. 22:35 P writes: just spoke to my best friend who was out at the weekend. He said after the parade he went to buy a wristband there wasn't one single person in the queue. Literally none. Walked straight up to the front. 22:00 CL says they have been in and out "a few times. But they can be arse holes about it." 19.35 No wristband is required to get into the HIV/AIDS Vigil tonight. When wristbands were introduced in 2003 the community was assured no one would ever be charged to get into the Vigil. But it was another lie. As this six minute video from 2007 shows, campaigners caught Manchester Pride red-handed and exposed lax security just two months after the Glasgow Airport terrorist attack. People who didn't purchase a wristband were made to stand on the street outside for more than an hour some years. In the video some waiting outside tell us what they think about Manchester Pride. The Festival Director of the time denies this happened. And despite the issue being raised subsequently with Pride and Tony Lloyd MP, Manchester Pride was caught on video again in 2008, still charging just to go into the Vigil. In this video clip from 2008 we catch the ticket office saying we must pay. Again in 2008 a security person tells our reporter a wristband must be purchased. Then we catch the chair of Manchester Pride (who was also the CEO of Marketing Manchester) as he emerges through a gap in the fence and we ask him about it. 16:20 Every year we bring you a previously-unseen video. Here is a three minute edit of the Huddersfield Pink Picnic in 1991. This fabulous footage has never been seen in public until today, 27 years on. If anyone can donate a Hi8 camcorder which (crucially) plays LP (long play) we will bring you video of the London Soho Pink Weekend 1994 on Old Compton Street. Time is running out to get the best possible transfers from these videotapes for the future. 15:25 Matt tells us he was "turned away from Sackville Gardens on Monday at 15:13 by a moody woman security guard." The Gardens are a bone of contention currently. In 2016 the Citywide Highways Manager at Manchester City Council stated that entry to Sackville Park couldn't be denied to non-wristband holders. 01:05 Paul says "just saw two women trying to get in. Two of them through the gate at Whitworth/Sackville. First one had a wristband so showed it and walked right through. Second one was 2 yard behind her and kept walking. He challenged her and said 'need to see your wristband...' And she said without hesitation 'I’m sorry mate I’m not feeling it'. And kept walking without any reduction in speed. Security stayed where he is but was staring at her for a good 30 second or more." This is interesting because earlier in the weekend there was a young woman who said she and her friends felt intimidated about walking through without a band. We believe the Council member of staff helped them to get in. Paul continues "so there is still a bit of 'question asking' if you will but unless you’ve had something via FAMP / Live Blog then there is no active attempt to obstruct anyone. The people entering the vileage are going through the same side of the barrier through which people are exiting it. That’s interesting. I stood there for over 20 min and they changed security person in that time and not one person was even asked for a wristband. 22:50 Craig "walked in through canal Street entrance near the courts late afternoon. Didn't get asked for wristband got served in Churchills no problem." 20:40 From P "there are people around but it’s like a normal Saturday rather than pride Sunday. Disaster for the bars. Takings have gone through the floor. Just spoke to a venue owner." 20:30 LS writes in a message "had 'wristbands' shouted at my mate n I last night, we ignored them and carried on, no one followed. Other mate has said they are not checking." The barrier guard shouted "although I wasn't on his radar he was already asking people to make them visible... I wasn't and didn't interact as they have no jurisdiction. Eagle appeared to be checking for wrist bands when there was a significant queue, later on with little queue we went straight in no issue." 21:10 Bev writes: "for the third year in a row, we entered the Village today after the parade without a wristband. In fact, today, we went in immediately as the parade finished and the gates were wide open and nobody - those with and those without - were checked for bands. Also, nobody was conducting bag checks either as we went in (which isn't that good really, considering the current climate...). Anyway, I also noticed quite a lot more police presence within the Village and near the gates. We just stayed in there for a couple of hours - visited the stalls and purchased a couple of bits, listened to some music and did some really bad singing and dancing (at the outdoor bar stages) and then we left to go and get some food :-) Have a good, safe Pride everyone. 15:33 Cody just broadcast a live video stream in our Facebook group as he walked through the gates at Thompsons Arms entrance without a wristband. Many people seem to be going in without any problem. Recording or streaming a video makes it even less likely that the security people will try it on. Video is great evidence of any wrongdoing. Video has played a crucial part in bringing this illegality to an end and will help to tell the story (and history) in years to come. 15:30 Carla writes "No issues getting in at the entrance by TriBeCa, staff seemed well informed about the right to enter without a band and no problem entering or being served at velvet!" 14:15 "Got in near the New York no problem and served in rem [Rembrandt] no problem. It's busy but nothing like previous years. 4.60 for a pint just isn't funny," writes Craig in a Facebook post. 14:10 A tweet from earlier reports that guards at the entrance at Tribeca are telling people to walk around. 23:15 K again "we got served in No1 Canal street and in Thompson’s. TBH, most bars don’t care. It’s money at the end of the day. Try your luck and go in, and if it’s raining they don’t care." "I just went through Gate 7 - Princess St to Sackville St. One steward in pink polo shirt but another with a black overcoat and no obvious sign he was a steward. Pink top one tried to stop me asking for a wristband. I said I don’t want one and kept walking. "Pink one started coming towards me and the black coat one stopped Him and said 'not while the police are here'. "There were 4 or 5 police at the gate too but out of ear shot. Outside the site too. I went out of the same one and asked him the gate number. He said I think it’s 7." 21:45 K says "we got into Pride, security didn’t ask to check our wristbands? They were too busy chatting to one side?" 19:28 According to this Facebook post Pride's security were unlawfully hassling people before the road closures even came into effect. 16:42 M writes "hi followed your work for couple of years. Just spoke to security staff at Sackville gate they said free flow entry all the time no problem about through flow or access to bars. Sound a well briefed." 14:55 Welcome to our 2018 live blog. We'll be updating this throughout the bank holiday weekend. Our initial impression is that everything seems very quiet this year. Based on what the City Council has written to us and what we've heard about the Police advising all concerned, we anticipate few problems. However, Pride seems to have wilfully disregarded the law and our civil rights since 2015 and may do again. Particularly if they think there won't be bands for the Village in 2019. It’s official: you have a legal right to walk to reach premises (homes or businesses) during Manchester Pride. Without a wristband, accreditation or a resident and visitor pass. Providing those premises can't be reached by an alternative route. 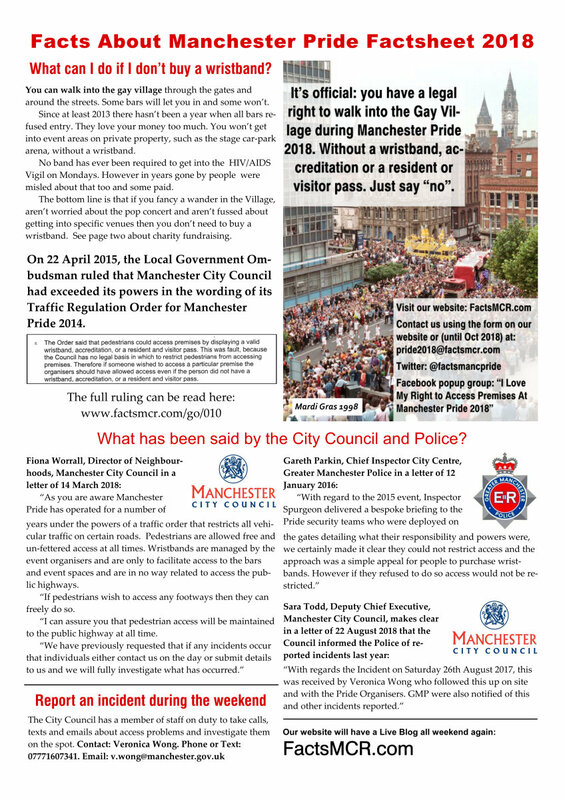 On 22 April 2015, the Local Government Ombudsman ruled that Manchester City Council’s wording of its Traffic Regulation Order for Manchester Pride 2014 was "unlawful." See the ruling here.